When you want to live in a historic neighborhood, but you’d like it better in a modern house*. There was an interesting debate in our Instagram account which inspired us to find out more about how these modern homes make it into historic neighborhoods like ours. The Richmond Commission of Architectural Review (CAR) was established by City Council in 1957. The CAR is the city’s official historic preservation body and is charged with reviewing all exterior changes to structures within the city’s Old and Historic Districts and issuing Certificates of Appropriateness for those projects that it deems to be appropriate. CAR bases all its decisions generally on the Secretary of the Interior’s Standards for Rehabilitation and New Construction; and specifically on the Richmond Old & Historic Districts Handbook and Design Review Guidelines (14 MB), adopted in 1999. All new residential and commercial construction, whether in the form of additions or entire buildings, should be compatible with the historic features that characterize their setting and context. To protect the context of the surrounding historic district, new construction should reference the materials, features, size, scale, proportions, and massing of the existing historic building or buildings in its setting. However, compatibility does not mean duplicating the existing buildings or environment. In order to avoid creating a false sense of history, new construction should also be discernible from the old. Perhaps the best way to think about a compatible new building (or addition) is that it should be a good neighbor; one that enhances the character of the existing district and respects its historic context, rather than being an exact (and misleading) reproduction of another building. We love the diversity of this neighborhood house and all. I’ll have to disagree there on that one. It’s NOT the modern whatever that makes this neighborhood. It’s the history and the historic houses that are over a hundred years old. It’s the stories they tell about our city and it’s past. Modern crap can’t do that. No offense. Historic is always better. The east end needs rebuilding and infill, not just rehab. I’d rather people build modern houses with modern materials than older-style houses with brick and steel. This city is very historic from the sidewalks to the houses, we need to keep it like that. Completely disrupts the neighborhood. But there’s s—y ’90s suburban vinyl infill already. So I guess thanks CAR. Personally, I like modern homes that are interspersed throughout the neighborhood. I know it’s not “historic,” but it is urban, and the urban character of the neighborhood is just as important to me. For infill it’s fine. Vacant lots, torn down/fire damaged buildings, fine. It provides a contrast. In general, I think it actually contributes to the historic character of neighborhood to have different historical architectural trends represented, but I’m really hating current residential architectural trends, so I guess I’m firmly on the fence. In my opinion modern construction designed to complement historic neighborhoods are great! Infill single family homes should maintain historic scale and architectural thought and significance, but also place it’s own time stamp in the ever changing neighborhoods. This house does all of that 100%! The inversion of what historic districts were supposed to promote. CAR is an oppressive waste. I totally agree with keeping historic scale. Can’t stand when I see McMansions in between smaller historic homes. Sticks out like a sore thumb and seems inappropriate. I love it! We need diversity of architecture. The new construction that is “faux” historic just looks silly to me – it’s not actually old, so why try to be old? I think new architectural styles can fit into my street on vacant parcels as long as the building’s general characteristics are in keeping with the neighborhood – e.g. has a front porch, is set back from the street. Chrissy Schlegel exactly. In my opinion this is the best option for new construction in a historic neighborhood experiencing revitalization. Like the style or not, this is complimentary and thoughtfully built with quality materials. It’s not a mass produced vinyl saltbox. I’ve seen more in the Fan and near west end and what I have seen I have liked. Most is done very well with thoughtful consideration of the environment of the community. In a few years, those “modern” homes will be historic also. Balance. Prefer old, but some new is ok.
All I see is gentrification. I’m surprised so many are hating on this specific house. While I prefer older houses myself and would love if we had never demolished our historic housing stock, this house is far from the worst in Church Hill. Seems like they did a good job making it fit in, it’s not like they are going to find 100 year old bricks and hand lay them to make the house fit in. Depends on the design. I think this picture would be ok. However, something like a ranch would be all wrong. I agree with filling in the vacant lots. Personally, I wish the city would fill in some vacant lots with little neighborhood parks with playgrounds. In 1910 church hill, people were complaining about all the Modern houses popping up around the historic, sparse 19th Century neighborhood. When the town of Sydney made way for the Fan, I can only imagine how disgusted people were to see the density of Park Ave in the 1890’s. That would be an awesome use for some of the lots RRHA has been sitting on for quite some time! Agreed, I think the intention here was to blend a historical American Foursquare frame with modern lines. Came out great IMO! It’s all about the zoning. If it’s zoned for a certain kind of appearance or materials, then that is what has to be done. If the zoning doesn’t specify but the neighborhood has some historic look, the owner has no obligation to follow it. These houses aren’t the pyramids. They’re normal houses of their era. They are older than average and share some visual characteristics. We are being overly precious about homes that were generally considered utilitarian at the time of their construction, if the sort of infill pictured is causing heartburn. Cities grow, change and reinterpret. Reuse of existing structures are great when feasible. New construction that adds to the tax base is great too. 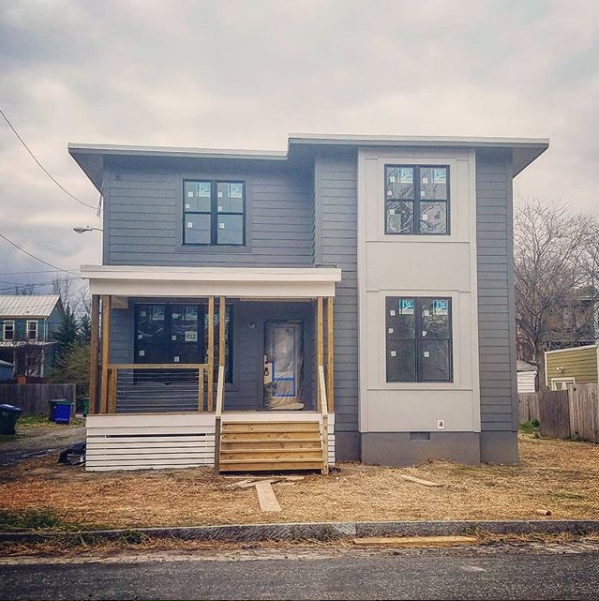 As long as they’re consistent with the scale, massing, setbacks and other characteristics of the neighborhood, I’d much rather see infill that looks contemporary, with modest nods to the design elements that characterize other houses in the immediate area. I feel they’re pleasant to look at. After moving into a block where one renovation, a fully detached, and a duplex have been completed in the past year, all with more or less the exact same style, I welcome it. BHC is getting ready to start “The Mills at Beckstoffers” over on 29th and I feel that will bring something much different than what we’re used to seeing on this side of the neighborhood. Please know I am not being sarcastic or snarky but what would you like to see instead of new homes on the lots (regardless of style; just going with the fact that it is a new home)? Ive seen it up here in Highland Park. Good on them to try but I think its a sunk investment. That construction started on 2016 and its been in its current state since 2017. On 2016 the house next door had issues with the city when they replaced the windows because they were in such a poor shape. So it seems unfair to me that one gets in trouble for not complying w/ “historic windows regulations” while the other one gets a green light for a new construction. However, what is even more concerning is that some properties in that area get a tax break for no apparent reason.The city had 0 tax improvement value for the year 2017 and even more interesting is that the land value remains the same even though we all get an average increase on property tax of 25% for 2018. Here is the link so you can see it. Are you saying ya or nah to gentrification? Thanks for the clarifying question. I took the response as a “nah” but now I see it could be construed either way. Depending on her view, my question could be negated. ? @Maritza – The reason so many of the new “faux-historic” style buildings are so subpar is the requirement that buildings be “Compatible but differentiated.” Basically, it’s difficult to do anything that’s too different, but also different to do anything that looks like it actually belongs. Consequently, there’s a lot of mediocre new houses that are neither “modern” enough or “historic” enough. And I don’t think anyone can really build anything in a historicist style unless it is a style that is already common in the neighborhood, so… Art Deco apartment building? Forget it. Spanish revival duplex? No way Tudor-Gothic Townhouse? Absolutely not. Unless it’s Italianate, Vernacular/Traditional, Greek Revival, Or *maybe* Second Empire, you can’t really do it. But even then it’s apparently difficult to get CAR to approve anything that looks like it actually belongs, because, to reiterate: New buildings must be sufficiently modern that people don’t get them confused. We need architectural review that rewards some combination of historic accuracy, aesthetic excellence, or creativity. I realize those last two are hard to measure and/or subjective but right now there’s no nod toward that at all. I’d love to see folks build historically accurate buildings. I’d also love to see them do something totally atypical or outlandish, as long as it has a design philosophy of it’s own rather than being “the cheapest thing we can build that satisfies CAR requirements”/rather than expressing nothing at all. Also – there are actually a few decent “historicist” new buildings in the neighborhood. Katina Wright’s real estate office was built a few years ago and other than a few minor details, looks really convincing as an Italianate storefront. It’s obviously new, but it blends right in (and is a pretty good argument that concerns about “faux historicism” and people not being able to differentiate between actual historic properties and new properties are nonsensical). there’s a right way and a wrong way to do everything. A mix is fine but this one is unattractive. Is CAR to blame? They have signed off on several marginal houses. My concern is new build apartments/condos like the one across from the Fire Station on 24th, and whatever is planned for Jefferson and 25th. I think those are to scale and use brick, so fall in CAR guidelines, but do more to destroy this neighborhood than individual modern homes, here and there, that also follow scale/material/context guidelines. Depends on what’s being torn down and wether it had good bones and was worth saving! @29 CQ, That’s the tax value for the condo association, each condo unit is taxed individually…. For instance, 309 Chimbo unit #2 paid $1,787 in 2017. Not a fan. It looks out of place. Always happy to see new buildings in place of dilapidated ones though! @ Anne: I think part of the problem with the buildings you mention is that there are so few historic buildings in the neighborhood that were built on that scale and that were built as apartments and/or shops. There’s nothing to really model these new buildings on other than maybe the neighborhood churches or the East End theater – and those buildings have architectural styles that don’t look appropriate (art deco, Greek revival, mostly) because there is so little of it in the neighborhood and because those styles are typically used for religious architecture and performance venues, rather than commercial spaces. Modern construction of a single family home in any style is better that a vacant lot or worse yet, keeping a dilapidated eyesore around waiting for someone to “restore” it just because it “historic. Historic is not always better. Many of these “historic gems” are super cold in the winter and hot in the summer and falling down around the occupants. Leave the nostalgia behind. OK… I am not going to read every post here but I am well familiar with architectural designs that don’t fit in for one reason or another. First, I am an advocate for the preservation and keeping this historic fabric of a neighborhood intact. But, you have to first take into consideration if the structure is in one of the doughnut holes? An area where O&H boundaries do not include where it sits? Keep in mind also that even if the house sits in an NHR (Historic Neighborhood Registry), this does not “protect” but only suggests and aids in enforcing unlike that of O&H. Next, the design is supposed to reflect what other architecture designs are immediate within eyeshot of it. With the example photo above, you can see an older design house in the background clearly within eyeshot but can’t see what is around it in this photo. CAR is supposed to sign off and enforce the O&H rules and guidelines but have often in the past, slipped them under the radar without allowing the public to weigh in on it first. Then there are times they have posted meeting dates but no one takes the time to go and voice their opinions. Diversification is fine and if you look, there are many 19th and early 20th century houses with various designs of the era but, they were echoes of eras previous and the building boom ended around 1903. There has been a 115-year gap this time and so, modern designs that do not incorporate the previous 19th-century elements, are a very stark contrast. And, the building techniques and materials used today means they most likely will be dilapidated within 50 years and don’t have the longevity as the rest of the community. I’m saying a big NO to gentrification. And I’m okay with this being on a lot as long as it doesn’t involve gentrification. And, as long as we can reverse the gentrification taking place all over, like “Church Hill NORTH.” Because gentrification is just colonialism 2.0. @48 Sarah TO… I hope you are simply jesting? As long as something salvageable & historic wasn’t torn to make way. Taking a note from most European countries and others much older than us. Respect our historic properties while adding growth and new dimension to neighborhoods. As long as they’re not like the monstrosity on Leigh between 28th and 29th. Talk about out of place! Love the house, but that porch looks like a last minute throw together with what funds they had left.